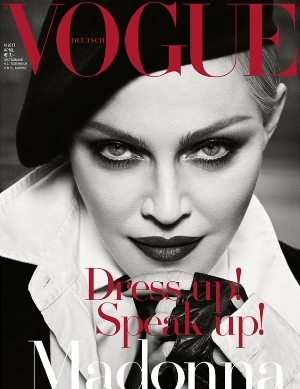 Recently, Madonna was seen on the covers of several magazines including this month’s “Vogue Italia” and February’s “US Harper’s Bazaar”. Now, we are also seen her appearing on “Vogue Germany” and it is special as this magazine usually provides less exposure to celebrities. 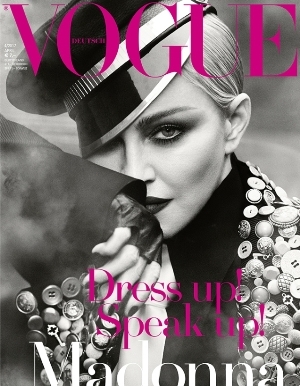 In the April edition of ‘Vogue Germany’, the singer is given place on the white and stark black covers of the magazine. Luigi and Iango were photographers for this edition of the magazine. Expressions from readers about the covers were different. Dodencebt said that these pictures are similar to that of “Harper’s Bazaar” and the only difference was her shiny back hair. The same idea was from Benn98 who said that it is the copy of the previous magazine and the performance of both photographers is really bad. Inlimbo accepted this Photoshop and declared it better than that of “Vogue Italia”. But MON and Platinum Blonde really liked these covers and they said that these covers are superb and one of the best by Madonna. Magsaddict and lelaid also appreciated the cover and praised the styles of Madonna that was beautifying the cover of the magazine.